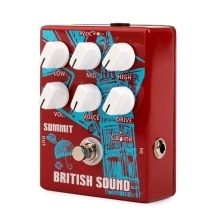 British style distortion pedal with flexible tone shaping controls gives you a huge selection of sound effects. With 6 control knobs for shaping EQ and overdrive response: LOW, MID, HIGH, VOL., VOICE, DRIVE. True bypass design, with LED light for indicating effect or bypass status. Aluminum alloy shell, durable and stable; compact size, space-saving and portable. Battery and power adapter are not included.